Personalized damask tote bag. Our favorite pattern is back for spring-summer or fall in a cotton fabric. 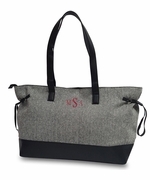 Attractive damask top border tote bag with sturdy straps. Front pocket with three seperate sections, web handles. Endless style for the woman on the go. Personalized damask tote bag measures 17"W x 14"H, four inch wide bottom. Overall height 24". I love this bag! What a great quality and find...especially for the price. My friends couldn't believe that price included the monogramming as well. It's sturdy and I use it for work and the gym which hangs perfectly in the gym locker. I will continue to shop from this company! Thank you!